A proposed 154-mile power line that will bring electricity from Canada to New England was approved by Vermont regulators this week. The $1.2 billion New England Clean Power Link would stretch across much of Vermont, including under Lake Champlain, and be capable of delivering 1,000 megawatts of power to a region with high electricity costs. Don Jessome, chief executive of the power line’s developer, TDI New England, said the “certificate of public good” his firm received Tuesday from Vermont regulators is the most important state permit that the project needs. TDI New England expects to file a request with the Federal Energy Regulatory Commission later this year for that agency’s approval. Construction on the project could begin in 2017 and be completed by mid-2019, he said. Jessome said his company has received interest from seven electricity suppliers interested in shipping power along the line. He said his firm is currently reviewing their proposals but declined to name the companies or the generation sources. The Clean Power Link is competing with another project to bring power from Canada, called Northern Pass, that is being funded by utility giant Eversource Energy. 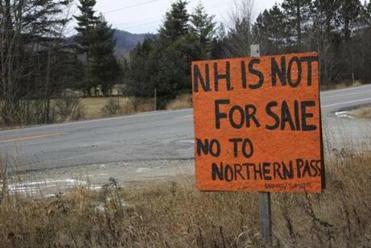 That project, however, has encountered stiff opposition along much of its path in northern New Hampshire, where residents complained the mountain scenery would be ruined by unsightly transmission towers and power lines. Eversource Energy said it would put 60 miles of its 192-mile power line project underground, primarily where it passes through the White Mountains area. In August, Eversource announced it would put about one-third of its 192-mile power line underground, primarily through the White Mountains. The Vermont project, by contrast, would be entirely underground or underwater — about two-thirds would be under Lake Champlain. The line’s potential invisibility has minimized the opposition. The Boston-based Conservation Law Foundation supports it, in part because of the promise of additional funds to clean up the lake. In Massachusetts, the Baker administration has proposed legislation that would essentially compel the state’s major utilities, Eversource and National Grid, to buy hydropower from Canada, which would help finance the construction of new power lines to import the electricity. Governor Charlie Baker and other New England governors see Canadian hydropower as a crucial way to reduce air pollution and global warming caused by burning fossil fuels, and to replace electricity lost through the retirement of older power plants within the region. A spokeswoman for Northern Pass said Eversource executives believe the project will be a key part of the solution to New England’s energy challenges. She also said Northern Pass is the only power line to Canada with a committed energy supplier — in its case, Hydro-Quebec — lined up.